Widout a bit of cotton. ‘Kase I ain’t a politician. The need for thousands of uniforms for soldiers heading into battle was a bonanza for northern cloth and clothing manufacturers. It also created a multitude of problems. Ready-wear clothing and sizing were just beginning to take hold in this period. So there was no uniform sizing system in existence. The quantities needed were also overwhelming. 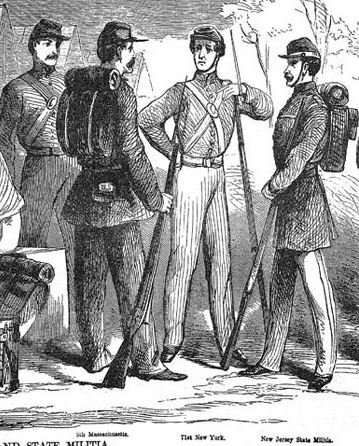 In 1861, 2 weeks after war was declared, Brooks Brothers of New York City received an order for 12,000 uniforms. In 1861 they produced over 36,000 uniforms. Shoddy uniforms became a popular topic of jest in newspapers, magazines, and songs of the day. Here are some voices of the time. And they came to pieces then. O the ripping l O the darning! O the tailoring unending ! A man very useful, indeed—to himself. Enough so to gain him a plenty of pelf. His pockets, by contracts for shoddy, to fill. CHORUS : Shod-shod-shoddy! How are you, Shoddy? And a great day of judgment that’s certainly coming. And where, Mr. Shoddy, will you be then? For surely so rich a man never can sin. For her husband is able to pay all her notes. CHORUS—3hod-shod-shoddy! Or seeking his rotten old shoddy to sell. But his soul has been bartered away to the devil. And soon the Old Nick will his property claim.